As soon as I heard about the Australian Pavlova Blog Hop (the first of dessert based blog hopping idea concocted by Delicieux – this month’s hostess, 84th & 3rd, The Hungry Australian, Dining With a Stud, The Capers of the Kitchen Crusader), I knew I had to join in. 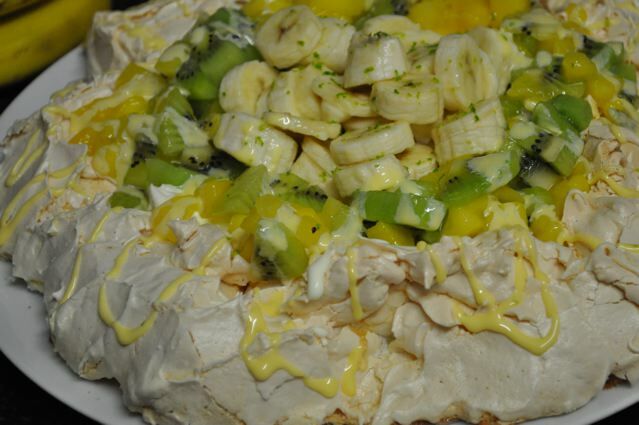 I do enjoy a pavlova and it had been eons since I last made one. The blog hop was running concurrently with the weekend I was planning to start on this month’s Daring Bakers’ challenge which happened to be meringue based also. I was on an egg white bender! I had a few days to think of something imaginative to fill my pavlova with but I couldn’t go past fresh fruit in the end. I watched the Junior Masterchef episode just recently when the young ones had to produce their own pavs with various creative touches but to be honest, adding curds, chocolate and anything else sweet just made my teeth ache thinking about it. Let’s face it: Pavlovas are hell sweet. There’s a fair amount of sugar involved in the average pav, and relief from the sugary sweetness is in the fresh cream and fruit topping. As a kid, the only thing that helped me persevere through a slice of pavlova was the occasional break you got from a chunk of strawberry or kiwi. I wanted A LOT of fruit so I smothered my base with mango, kiwi and banana dressed with fresh lime juice and lime zest. If you’d like to join in on the fluffy meringue fun, join the blog hop here. Thank you for joining us in the Pavlova Blog Hop!! 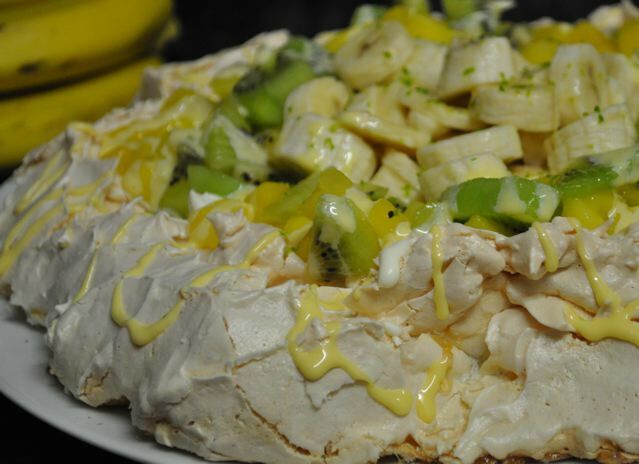 Your pavlova looks fantastic. I didn’t know Daring Bakers were running a meringue based event at the same time. How funny. Love the addition of the bananas! My fave fruit :D Thanks so much for joining!! Yum, absolutely delicious. I wish I could eat Kiwi fruit, it makes my mouth all itchy inside ) : Great post. Glad you could join us. Really like the Pernod and Lime idea! Thank you for coming up with this fun idea! I am a sucker for the Pernod & lime combo. It worked well! What a great idea – adding a pernod and lime topping, and lime juice and zest to the fruit. Pavlovas are so sweet I think anything acidy can add to cut through the sweetness works really well. So glad you could join the blog hop!